I had no idea that coffee is actually good for you, within moderation, of course, like anything else. After watching a medical show a few days ago, I learned that coffee has several health benefits. 4. Coffee reduces heart diseases and cardiovascular diseases. But as a 32 year old woman it may come as a surprise that I’ve never had a cup of coffee in my life. I wanted to start so I tempted Darren with the idea of drinking coffee and he took the bait. He loves researching new products and he was off on a search for the best coffee, coffee makers, and coffee related products. their full flavor profile, they must be ground right before coming in contact with hot water. This is where the electric coffee grinder BISTRO comes in and becomes part of the coffee making ritual. 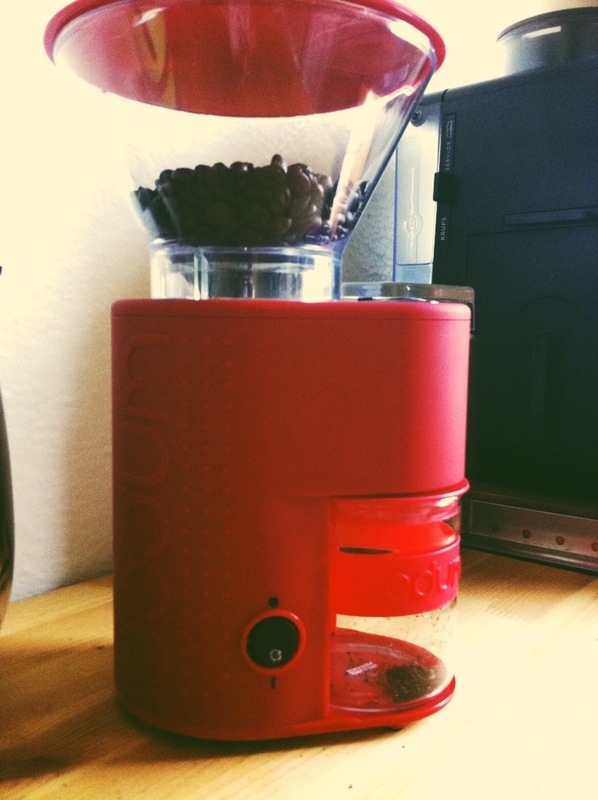 Bodum’s Bistro Burr Grinder is a must have in any coffee lovers collection. The beauty of a burr grinder as apposed to a blade grinder is that it actually crushes the beans rather than slicing them, which allows the flavor profile to remain intact. Most coffee grinders use plastic containers to receive the ground coffee but plastic and ground coffee don’t go together well (the powder gets statically charged and spills all over the place).The catcher of the BISTRO is made of borosilicate glass, which actually helps eliminate static cling. This and the tight plastic/rubber lid make for an excellent, no-spill coffee grinder. The borosilicate glass container comes with a silicone band to make it slip-proof, an especially important feature when touched with wet hands. BISTRO is continuously adjustable; twisting the upper bean container determines how finely ground the beans will be.There are several settings, which allow you to grind coarsely for a French press all the way to finely for a cup of espresso. I wasn’t sure what to expect with my first cup of coffee. The aroma was delightful and it filled the apartment. It reminded me of being a child sitting at the breakfast table with my grandparents while they had their “morning cup” and I ate bacon, eggs, and toast. I blew away the steam and tried it; my mouth watered with the unique flavor and I wasn’t certain I enjoyed it. I finished the cup without adding cream or sugar. A few days in, I welcome the taste and look forward to my “morning cup”. It’s something I never thought I’d say, but I’m officially a coffee drinker. Now, to figure out the different kinds, flavors, and what I like in it is another story. THIS GIVEAWAY IS NOW CLOSED! 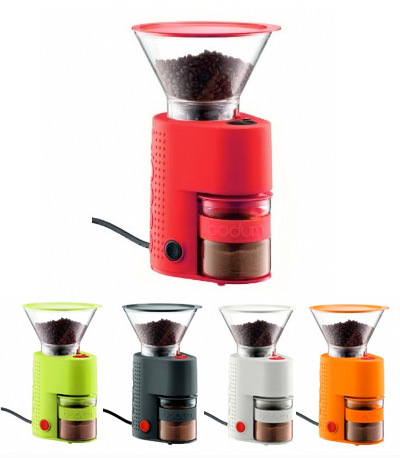 THE WINNER, RANDY DUBE, HAS BEEN CONTACTED AND WILL RECEIVE A NEW BODUM BISTRO BURR GRINDER! THANKS FOR ENTERING AND STAY TUNED FOR MORE CONTESTS AND GIVEAWAYS. This entry was posted in Uncategorized and tagged @BodumNA, Bodum, bucket list, Bucket List Publications, coffee, coffee grinder, Giveaway, Lesley Carter, travel, Travel blog by lesleycarter. Bookmark the permalink. Don’t drink it either. Never have. I wouldn’t ever sleep if I did. I didn’t start drinking coffee until my thirties, too. Now I just love my one a day – coffee! And guess what else is good about coffee? It’s good to the last drop… Enjoy! It gives me a headache but I should start drinking it for the benefits. I started with a one or twice monthly cup of coffee when I was 10 ! Now nothing can beat a leisurely weekend morning cup. I didn’t start till I was in my mid twenties. I tried it at first with cream and also sugar and didn’t like it with anything added to it. Love my 2 cups in the morning just black. My favorite is Door County Breakfast Blend. We have a local store where I can buy it but they also have a great website where anyone can order. Best coffee I have ever had. 😀 i still cant believe you havent had coffee before this 😀 and youre right, it is very healthy! apart from the caffiene thing, its rich in antioxidants, so that helps in lowering the risk of cancer and it promotes clearer thinking 🙂 hope you loved it.. I love coffee but ive started loving tea even more off late, especially green/liquor tea! have you tried it? what do you think? I came late to coffee, but now I look forward to the ritual cup in the morning and after lunch. I also just like the process of brewing it, measuring the water, and grinding the beans. Or measuring the ground beans. I became a devotee of flavored coffees, pecan, crem brulee, kahlua, chocolate, pumpkin spice. Enjoy! What! You just didn’t go down to the local Starbucks and buy a cup of coffee? I am not much of a coffee drinker myself. Maybe if friends are drinking coffee I will join them, but I am mainly a tee drinker. The exception is when I go to Germany. I really like their coffee. That looks like a good five reasons, but add me to the list, “never had a cup”, and I’m nearly 40 now…. Glad you discovered this little morning pleasure. Not to mention that I’ve always dreamed of a cup of kopi luwak coffee. I’m a big coffee drinker. A smooth nutty finish is in my preferred flavor for a cup of Jo. Wow you have never drank coffee? Welcome. I remember as a little girl, I’d find my mothers cup on her vanity and as she would do her hair I’d still sips of the now-cold brew. I fell in love with how she put her coffee together, cream and a little sugar. As I got older, Iced coffee was the beginning, then as a high school teen I can remember mornings spent ditching homeroom at the Carl’s JR with my gf’s sipping styrofoam brews and burning our tongues. Moving to Europe my tastes in coffee developed as my taste buds took to the finer things in life. I love a good hardy cup of Joe. But I can still enjoy a field coffee of hot water, instant coffee, and a dash of cocoa from an MRE pack to create a tasty field Mocha. While I enjoy the fine things of life, I still enjoy a cup of Joe that’s just your basic mug of wanna be loved beans. This grinder sounds like a great addition to my kitchen, and as I found the K-cup pot has a filter you can fill with your own beans it sounds like a joining of recycle and reuse to get away from the morning toss of the K-cup plastic to a delicious union of blessed fresh grind only in the one cup size I like, freshly brewed when I want it. I’m glad you enjoyed your experience! …drank lots of flaming hot coffee in the Persian Gulf (1st Gulf War) and had the personal pleasure of seeing the Great General speak will drinking his Morning Joe. Try Kona – it’s Hawaiian. One of the best in the world. Welcome to the club. I agree! Kona coffee is amazing! We just put in an order directly from Hawaii. Patiently awaiting its arrival! I never have coffee, and that’s peculiar for an Italian. I love the aroma, but not the taste. But I’m sure you have began a new chapter of your already full life. Mind you: coffee is a sort of addiction and you’ll soon realize that, if you get to love the taste of a particular good one, you’ll be missing it when you’re away from home. I know lots of people frustrated when on travel because they can’t get “a cup of decent coffee”. I’m not a coffee drinker myself, but my husband is and he loves our Bodum french press. He swears by it and vows to never own a conventional coffee maker again. Add coffee to addictive too! I was quite hooked on the stuff a couple years ago! Yes, you are right about its health qualities. I remember when I learnt it was actually good for you in moderation I was shocked too. 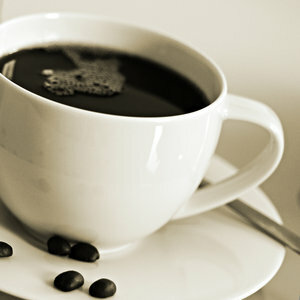 I always try to have at least one coffee a day, but it has to be good quality, as I love black coffee! I hate milk or cream invading the taste!! Hope you have enjoyed your new coffee experience? Good One… I’m a coffee addict. O.k. I admit it… It’s all in the food. If we could just take all the preservatives, Sodium, Syrup and so on we will have a healthier life. I didn’t start drinking coffee until I was 42. Always loved the smell. Could not stomach the taste. I literally woke up one morning and told Husband I needed to start drinking coffee. Love it. No wonder I feel great most of the time :)! I am a total coffee snob, that would go great in my kitchen! lol.. I love coffee! I used to hate the smell of it and I didn’t get why Starbucks was so popular (honestly, I still don’t get it…their coffee is burnt and wayyy too bitter.) In the last couple of years, I’ve become somewhat of a coffee nerd, learning about brewing techniques and the best way to extract the great coffee flavour out of coffee beans. So agree with you. Don’t have this particular grinder, but researched for a long time to get what I have. Also the coffe makes a huge difference. I found the only beans that do it for me are the DazBog French Roast. If you ever review coffee makers, look at La Pavoni. I won’t use anything else. Great post. One good cup of coffe per day works for me (maybe two on weekends). Keep up the good work. I have a bit of coffee every morning but not too much. I Love coffee! probably drink too much of it.. I’ve got a Senseo machine but I’d like a proper Nespresso machine when it wears out.. also lived in Turkey – their coffee is much like that found in the other Med countries – Lebanon, Greece, Egypt.. I know most readers here are probably American but Starbucks isn’t real coffee and neither is the instant powder us English seem to like.. I just started drinking coffee on a daily basis. Once you’ve french pressed, you won’t want it any other way…and real coffee lovers do enjoy it black! I’d like to say coffee was in my cup but usually it’s Captain Morgan. Great giveaway though! Coffee is like the bane of my life I am very allergic to coffee and even have an Epipen, if I accidentally have it I can go into analphylactic shock. I have found it in the most bizarre things. I’ve been a total coffee addict for years. I swear I don’t see in color in the morning until after I’ve had my first cup. Imagine my joy when it came out that it is actually good for you. I LOVE COFFEE! Even though my blog is called Sweet Tea Theology…but there is truly nothing better than a great cup o’ joe, any time of the day or night! I actually hate coffee although I watch with envy the ritual of the morning cup of joe. My husband thinks its the food of the gods. So he would love this post. Lesley, as a bit of a coffee…um….snob, I own a Krups with a built-in grinder. But years ago when I started I was drinking what those in caffeinated circles would call “truck driver coffee.” Leaded, as opposed to unleaded (decaf), strong and black. That’s how they did it on the flightline and it just stuck. I’ve tried just about every brand on the market. Most recently the Italian brand, ILLY. It’s smooth and full bodied with no acidic, bitter aftertaste, very enjoyable, pricey- $13-16 dollars a can – but less expensive than having a daily Starbucks. I used to only drink coffee when I worked a night shift, but after having my son, it has become a must. Great give-away. Would love to win it. I drink a cup a day so this is good news. I also want to say I tried “liking” your last five posts, but couldn’t get it to work. The page would refresh but the like never took. 😦 So if you don’t see many likes, please know it’s a computer glitch. I love your stuff! There is something divine about starting my day with an amazing cup of coffee. 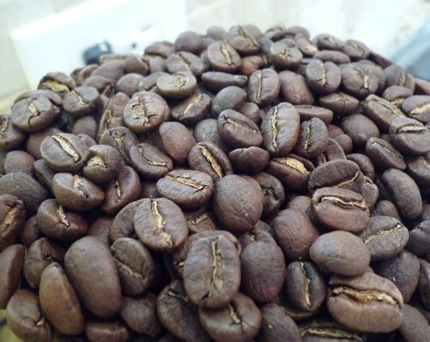 The smell of the beans being ground followed by the aroma of that freshly brewed cup is to die for!